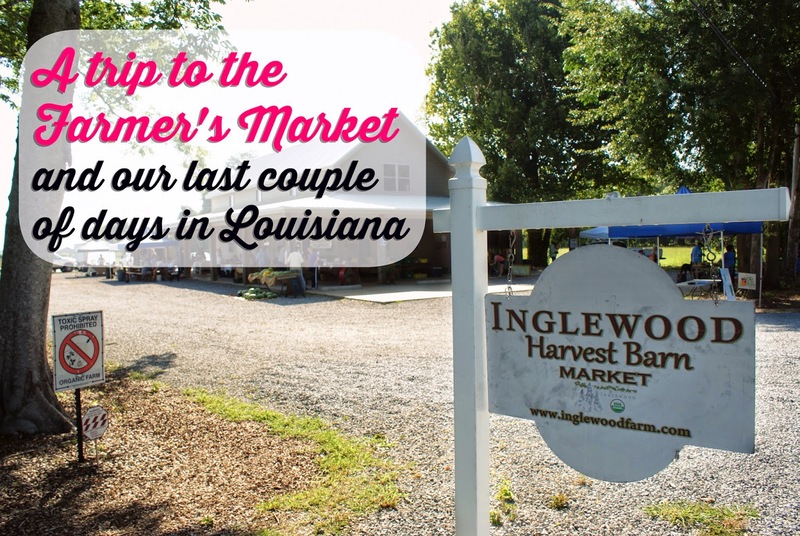 Southern In Law: #SILintheSouth A trip to the Farmer's Markets and our last days in Louisiana! 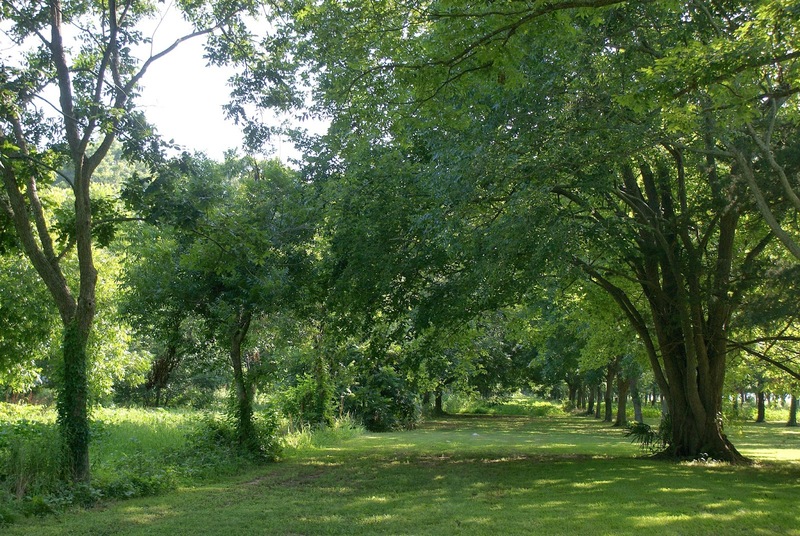 #SILintheSouth A trip to the Farmer's Markets and our last days in Louisiana! Hey sweet peas! We're back in Australia safe and sound and I'm currently battling some serious vertigo like symptoms after spending way too long on planes. We got back yesterday morning at 8am and I've been riding my own personal roller coaster ever since. 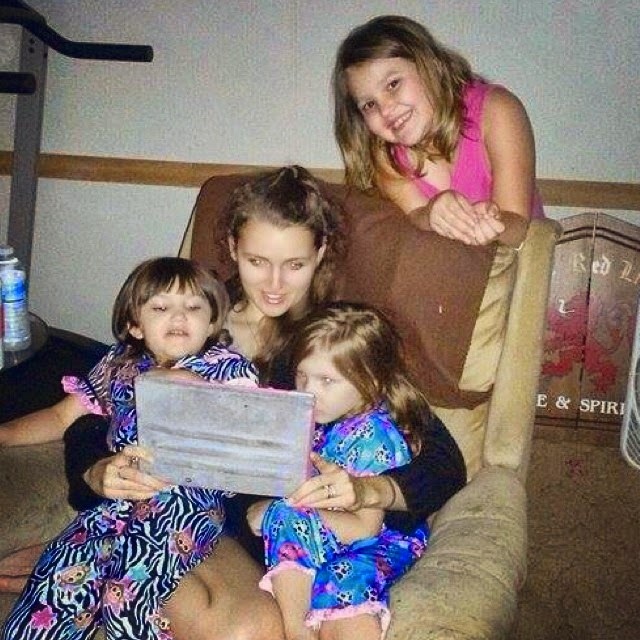 But let's forget about that - I want to tell you about our last couple of days in Louisiana so let's get to it! 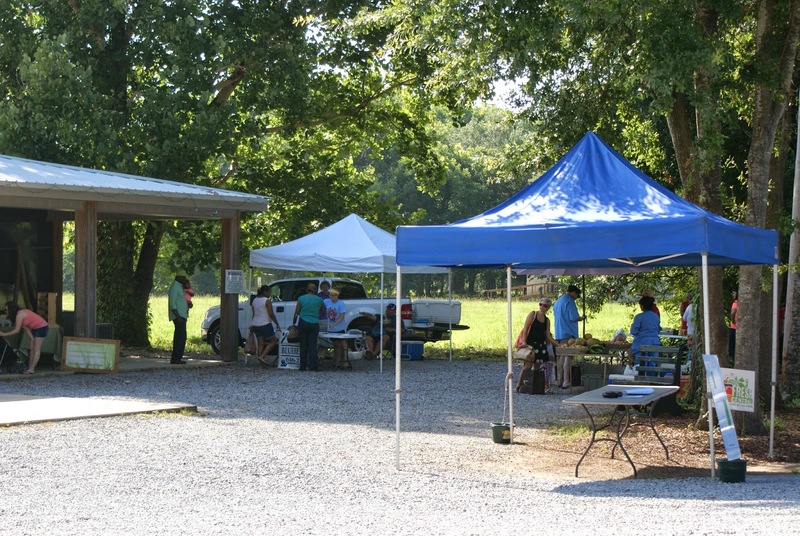 On Saturday morning we got up bright and early and headed down the highway to Inglewood Farm for their Farmer's Market! 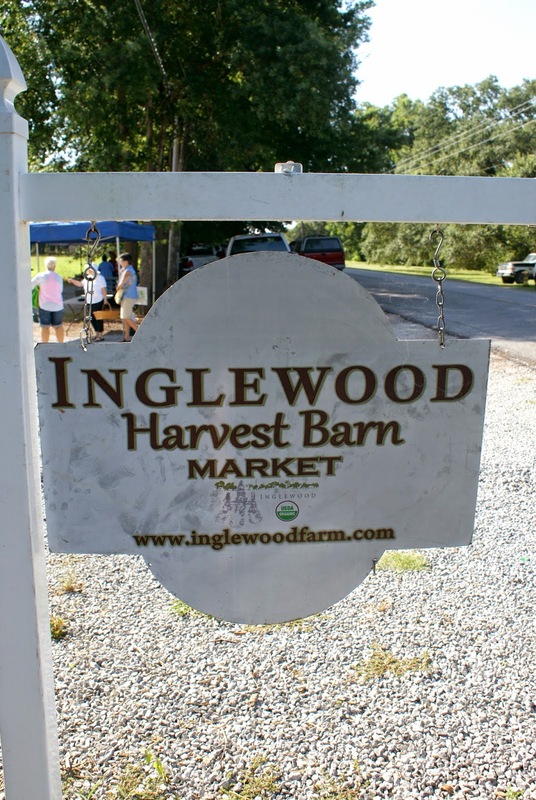 Inglewood is a local Organic Farm which opens to the public every Tuesday evening and Saturday morning to sell their incredible produce. 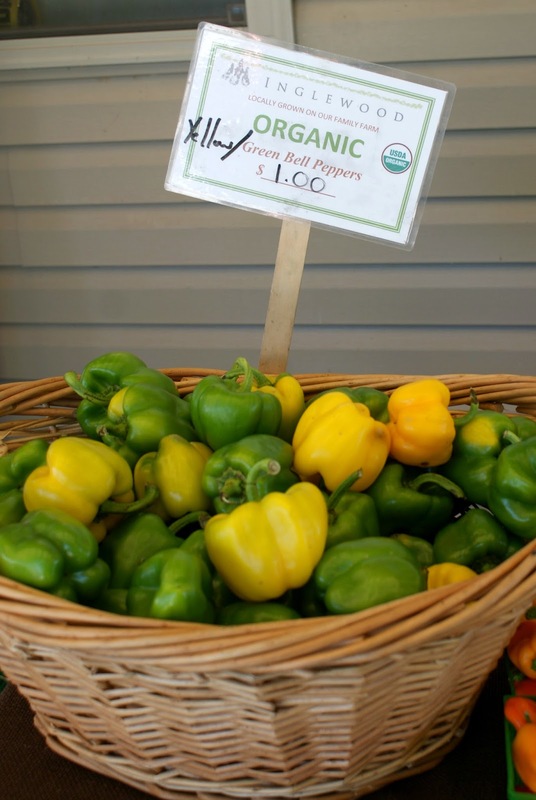 The Saturday Farmer's Market also includes a number of stallholders - mainly local farmers and producers selling their goods as well as a couple of local bands and food-stalls to keep everyone entertained. 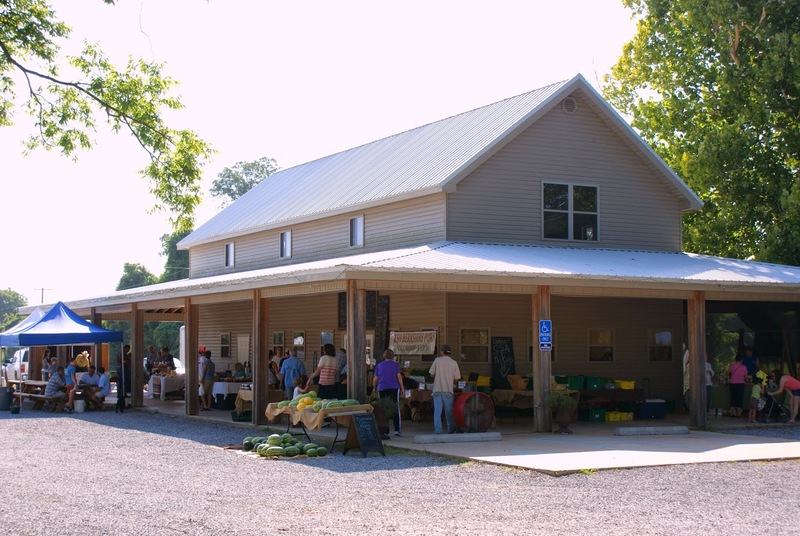 It's a small market, but has all of the fresh, local, seasonal produce you need - from fresh watermelons and blueberries to eggplants and cucumbers and everything inbetween. One of my favourite Farmer's Market buys have always been cherry tomatoes. Now that I can't eat them, I had to make sure my husband bought some to eat for me - so buy we did! 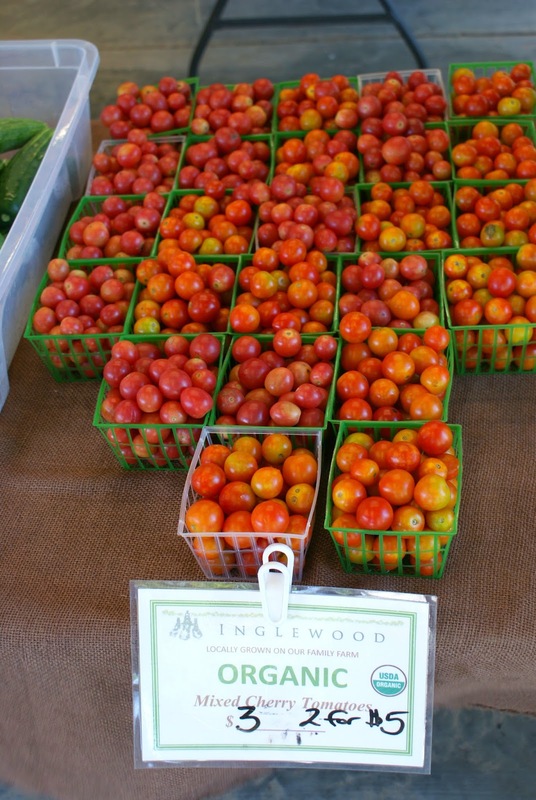 Two punnets of the juiciest cherry tomatoes made their way into our basket. Jesse had been feeling pretty gross thanks to the greasy fast food he'd been eating with his brother lately so he was craving vegetables. 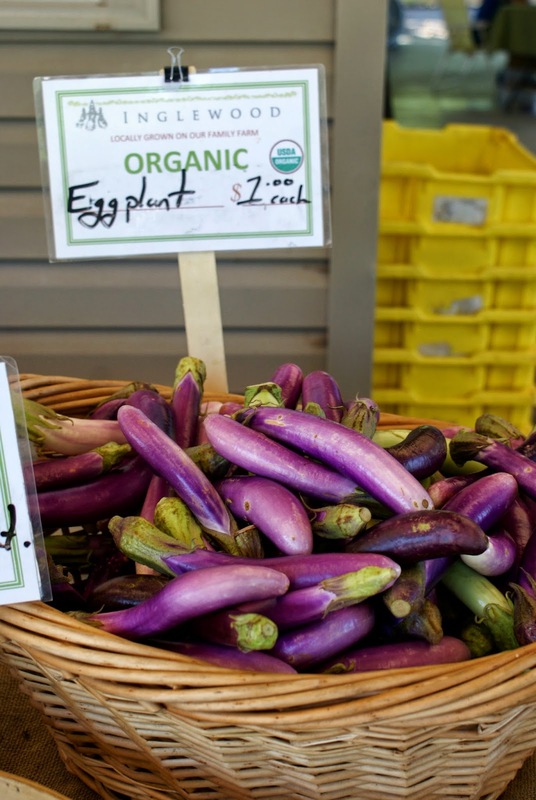 We picked up some zucchini, summer squash and some of these cute little eggplants to grill later on. 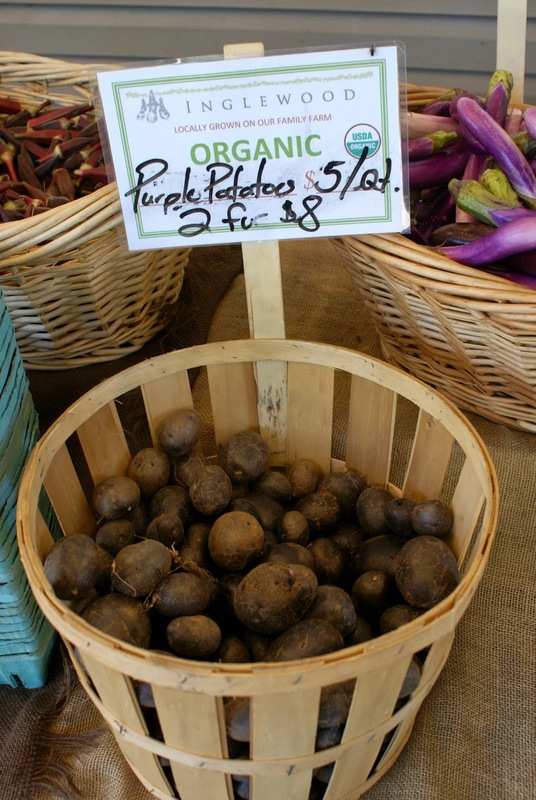 I love all the different varieties of produce you can find at Farmer's Markets and I wished we were staying longer so I could have bought a bunch of these purple potatoes - but we had too much food back at the house to use up already! But my favourite buy? 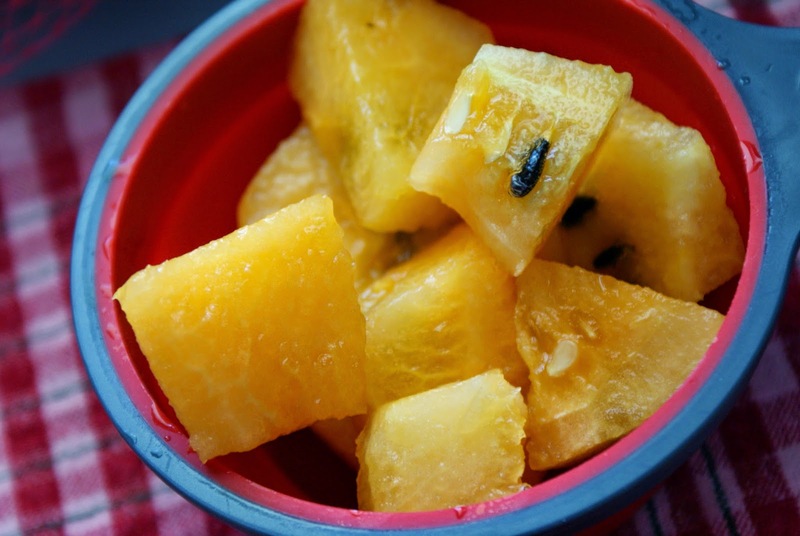 A crispy, juicy golden watermelon baby picked up just for me. Holyyyyyyyyyyyyyyyyyyyyyyyyy yum organic watermelon just tastes a million times better - especially because it was bought so soon after picking (instead of goodness knows how long like the watermelons you get from the supermarket!). It had heaps of seeds but it was totally worth it. On Sunday Jesse's Pawpaw, Dad and cousins came over for lunch - I grilled up our farmer's market veggies and made a salad and they brought along fried chicken (balance? lol) and before we knew it, we had to head to the airport! 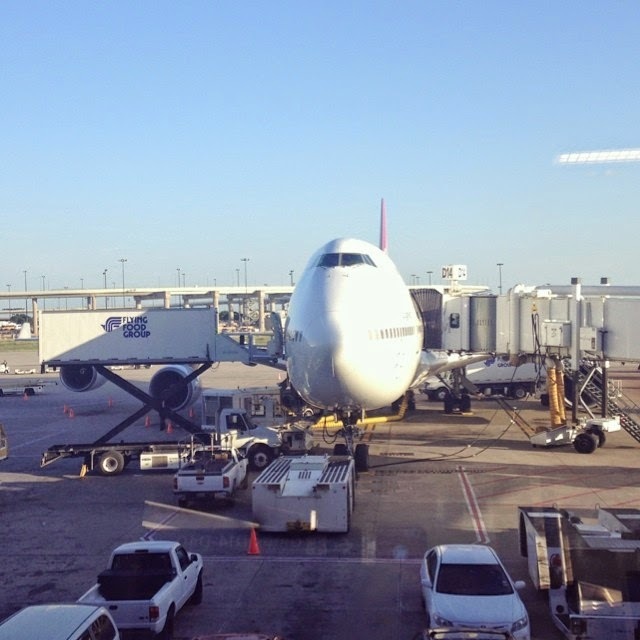 We started our journey home at about 5pm when we got to Alexandria Airport. Our 6:20pm flight to Dallas was a little bit late, but after a quick one hour flight we made it safely! Then we had some time to kill before our big flight. Our flight into Brisbane (then connecting onto Sydney after a quick refuel) was scheduled for 10:55pm, however, it was delayed for half an hour as wind conditions would mean we'd arrive in Brisbane an hour earlier than planned - an hour before the airport even opened for the day. As painful as it was to wait half an hour when we were already so tired, it was better than waiting for an hour on the plane on the tarmac once we got to Brisbane. Before long we were on the plane and it was a longggggggggggggggg sixteen hour flight. Jesse and I started the flight watching Rio 2 (which was seriously disappointing after the first movie!) and then we both slept for most of the flight. We were stuck in the middle of the middle row with two people either side of us who slept for the entire flight, only getting up once each to go to the bathroom (and you have to know we followed each of them so we could finally go to the bathroom too haha) so sleeping was pretty much all we could do. We arrived at Brisbane at a little before 5am in the morning and waited for our flight to Sydney which landed at 8:30am. We got through customs and immigration in record time and were home before 10am! 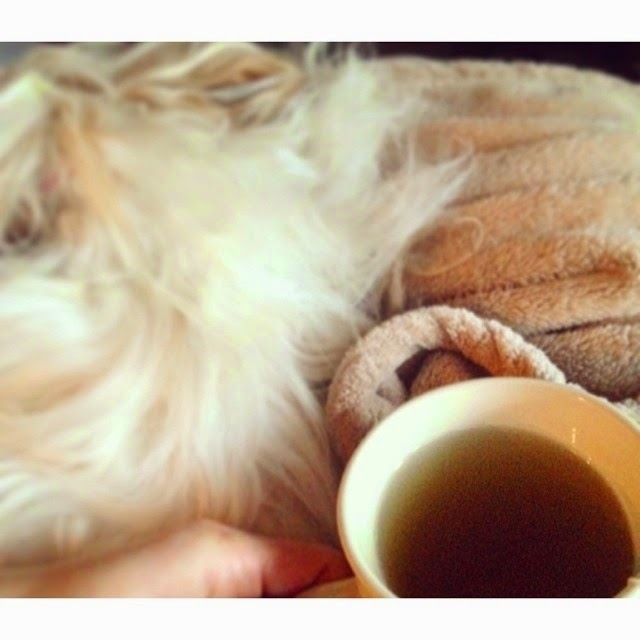 So, of course, I made the most of my snuggle time with my puppy! We seriously missed Chanel and I don't think a single day went by where we weren't talking about how much we missed her. We brought her back a collection of clothes and toys and goodies and snuggled her like mad. But then I started to feel odd. You know how when you're on a boat for quite some time and you get off and still feel like you're rocking on the water? Multiply that by about 3000 and you've got how I'm feeling now. I'm on Kristy's own personal roller coaster and I just want to get off. I'm constantly dizzy and my ears are buzzing -whether I'm sitting, laying, standing or crouched down in a little ball of crankiness. I'm thinking it's worse because I actually slept on the plane (I get motion sickness really easily but are never actually sick - I usually just get nauseous or dizzy) and also because I hardly kept my earphones in during the flight so the constant drone of the engine was ringing in my ears. 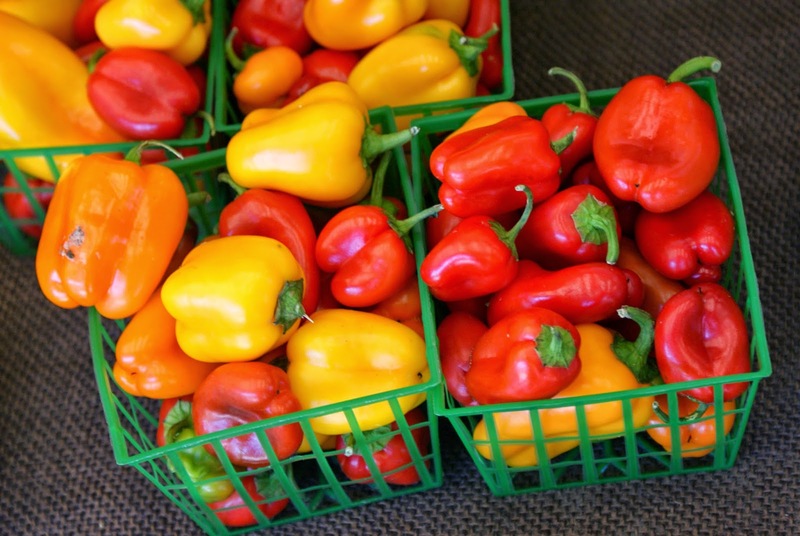 But tell me, what are your must-buys at a Farmer's Market? What produce are you loving right now? In Louisiana it was watermelon but now i'm back home it's apples because they're in season and ab-so-freaking-lutely delicious. 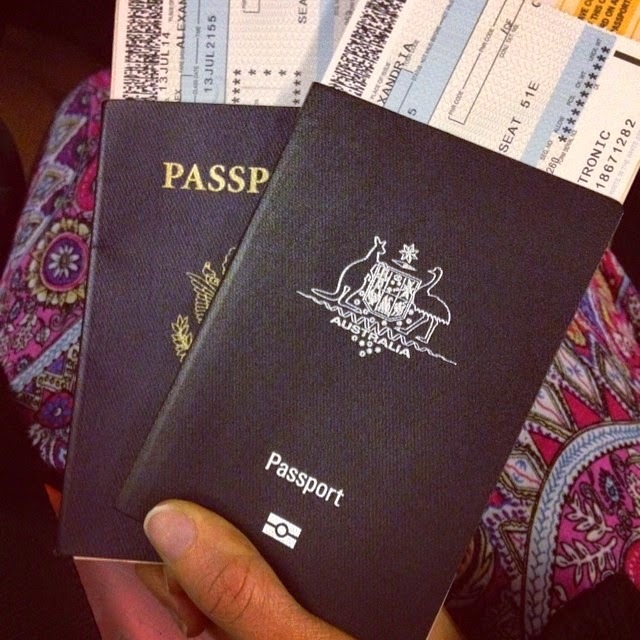 Have you ever experienced vertigo/dizziness after traveling?